Provides a quick, no frills, way to apply any Web, App, or Other transform to its respective parent in place. This tool is meant to speed local development transforming. Provides a quick, no frills, way to apply any Web or App transform to its respective parent in place. This tool is meant to speed local development. Right click on a transform (ex: Web.Release.config). 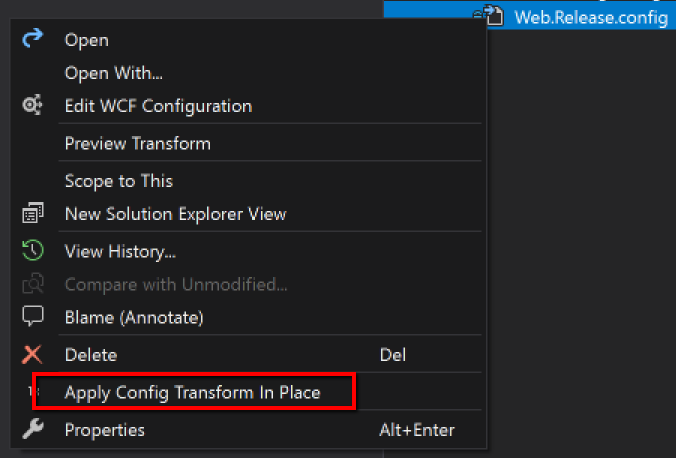 The tool finds the relative Web.config in the same directory and applies the transform.